Live from Swaziland ... it's Saturday morning! 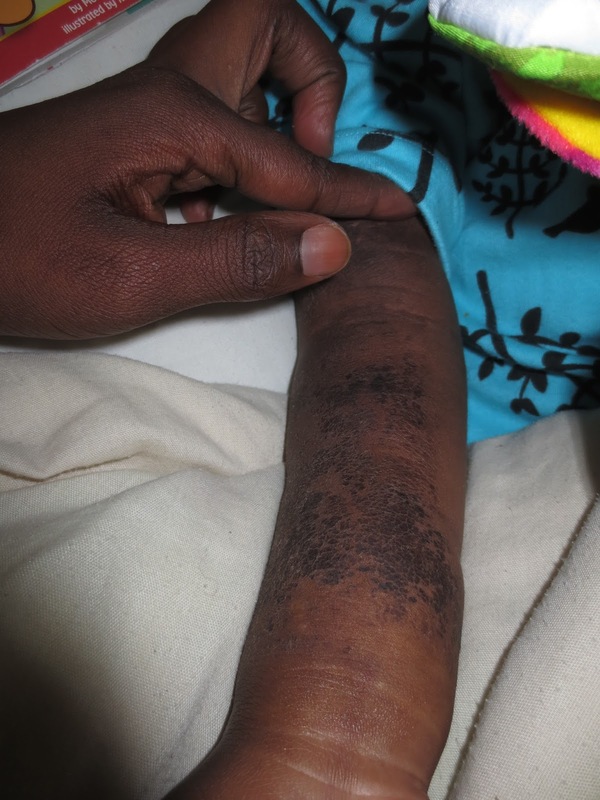 : 2-year-old has five breaks in her right arm? 2-year-old has five breaks in her right arm? This week I got a call about a child who is 2-years old and had a broken leg. I was told that the hospital would not operate on the child until they were assured that she would have a place of safety to live when she was discharged from the hospital. Thursday I met the child. 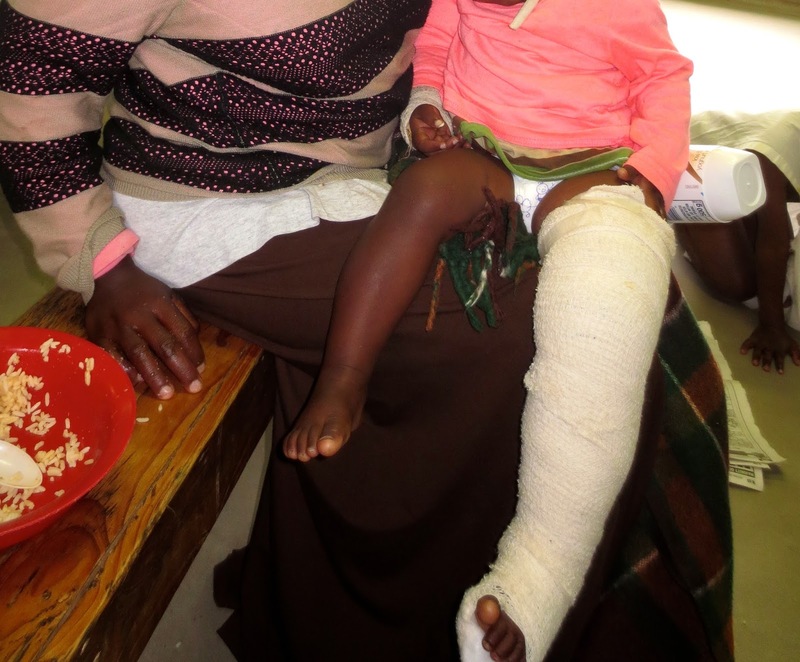 It wasn’t just a broken leg that this child had, it was a year-long history of living in hell with family members who were abusing her. Her right arm had five separate breaks, but the Doctors told me that many of those breaks had been broken again after they had healed. Then there was the leg. Both the femur and the tibia were badly broken. The Doctor said it was a classic case of child abuse because the breaks were just on the top and bottom of the knee. When we removed the bandage that wrapped the arm for protection from further breaks we discovered large burn scars and rotting flesh. She is also missing the end of the finger next to her pinky. She doesn't speak at all. No words. She understands direction and raises her eyebrows to acknowledge that she heard the question, but not a word has been spoken from her lips. The mother of the child was with her in the hospital, but she has the mental capacity of an 8-year-old. She just smiled every time we looked at her, while her child went in and out of consciousness due to the pain she was in. The leg had been broken on Sunday, and it was now Thursday. The aspirin equivalent that she was given just wasn’t enough. The mother had no idea how the child’s bones had been broken, no idea how she had been burned, but said that some children had been hitting her finger with rocks and finally the end of it just fell off. After a long day and the help of the Magistrate’s Court and Social Welfare Office I was heading to a private hospital with the mother and child in the back seat of my borrowed vehicle (our cars are broken down). When we arrived we met with the Orthopedic surgeon right away and after looking at the x-rays he said that he would do surgery the following day to wire her bones back together. After looking at her arm, he said he would need to work on a “strategy” for the arm because there were so many breaks that hadn’t healed together and there were two fairly new ones that had started to heal. Yesterday the child was operated on and just an hour in to the surgery I received an urgent call from the local laboratory. They asked if I was the legal guardian for the child and I said, yes. They asked if I would be paying the bill for the child and I said, yes. They told me that she needed a blood transfusion and would I come in and pay for the blood immediately so that they could send it to the hospital. I was an hour’s drive from town and she was lying open on the operating table. Thankfully we have an account with that lab (based on the number of sick/hurting kids we deal with) and I was able to assure her that I would pay the bill. (30-minutes later the Accounting department called and asked for my email address so that they could send me the bill straight away). Yes, we will pay the bill. There is more to the story that I can’t share in a public blog because it wouldn't be right for the child. But rest assured that a team of people from Social Welfare and the Child Protection division of the police (and me) will be on this case until someone is in prison. Pointing out the breaks in her arm. I went to visit her this morning and took some children’s DVD’s (we have a portable DVD player that goes on all hospital stays) and snuggly toys. Today she will see the first movie of her whole life. Today she is safe. Today her body will start to heal and we pray that her heart and her memories will begin to heal too. One day she will speak and sing and dance. Phephile (Pa-pee-lay), you are loved. Live from Swaziland … I just don’t understand child abuse.